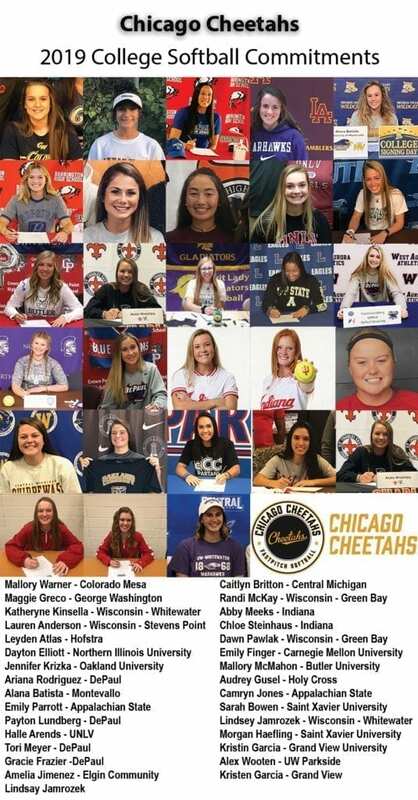 The Chicago Cheetahs are a competitive travel girls fastpitch softball program, with intent for college exposure and located in Downers Grove, IL. The Chicago Cheetahs are players looking to play a very competitive Nationals travel schedule, exposing our players to many different tournaments, challenging them to compete at the highest level. Our commitment to player development is unmatched in the midwest. If your looking to play softball in college, the Chicago Cheetahs are for you. The Chicago Cheetahs currently consist of one 18u Premier team, two 16u Premier teams, and two 14u Premier teams. This is a collection of Chicago Cheetahs that have committed/signed to different colleges/universities. For a full listing of alumni and where their efforts have taken them, please review the alumni page. Mallory Warner Colorado Mesa U.
Chicago Cheetahs play prominent roles on many of top 20 High School teams in area!! CHICAGO FASTPITCH ACADEMY (Home of the Cheetahs), is part of the D.O.L.L.S. fast-pitch softball program, which is an affiliate organization of the Downers Grove Park District (Affiliates) and (Youth Sports) for more information. Contact Brian Bowman 630-888-8428 for tryout information.